Local and offshore buyers are flocking to auctions across Melbourne in a bid to get their hands on hot commercial property investments. Colliers International has sold four properties in one day, all at auction, amidst strong competition in both the CBD and metropolitan property markets. Daniel Wolman, Colliers International Director – CBD Sales, said the strength of the sub-$10 million commercial market was reflected in recent auction turnout and results. “In the entry level market, where properties range between $1 million to $10 million and investors are looking for affordability, auctions are a great option for all parties,” Mr Wolman said. “For vendors, auction conditions create increased competition from a wide range of buyers who all come together on the day and battle it out for a property, encouraging prices to reach maximum levels. “But it is also a great way for buyers to purchase because it’s the most transparent way to buy a property – they know exactly what they’re buying and exactly who they are bidding against. In the most recent public auction in the Melbourne CBD, Mr Wolman and colleague Oliver Hay sold 51-53 A’Beckett Street under the hammer for $4.6 million. The three-level office and retail building was sold on behalf of two local private investors, with the auction attracting a 100-strong crowd and 20 bids from five potential buyers. [urbanRelatedPost][/urbanRelatedPost]The property attracted a capital value of $31,293/sqm on the 147sqm site and a yield of 4.8 per cent. “The impressive turnout at the auction was despite poor weather, which further proves that well located, prime property will attract keen interest in the current economic environment, regardless of conditions on auction day,” Mr Wolman, the auctioneer, said. “Local onsite auctions are also attracting significant interest from offshore buyers who are still keen to get their hands on Melbourne real estate due to high standard of living on offer and the cheap Australian dollar. 51-53 A’Beckett Street was substantially renovated in 2007 and currently provides 257sqm of high quality boutique office accommodation on the upper levels and 95sqm of retail on the ground floor, currently home to a restaurant. The property also includes a north-facing rooftop terrace of approximately 27sqm. 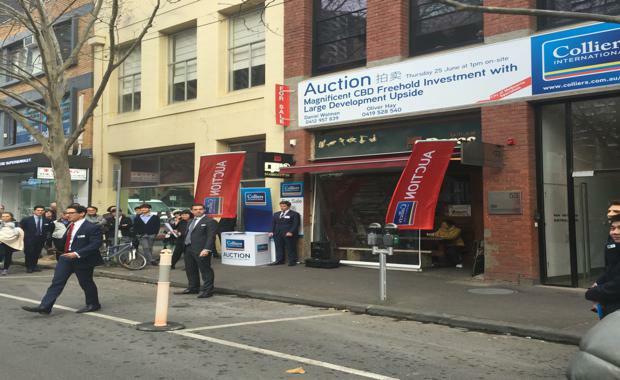 On the same day, Colliers International sold three other properties at auctions across Melbourne. Agents Guy Wells, Pat Connolly and Ted Dwyer sold The Laird Hotel at 149 Gipps Street in Abbotsford for $2.66 million, on a yield of 4.5 per cent. In front of a strong crowd of approximately 80 people, competitive bidding from three parties saw the property knocked down to a local private investor. “The property was well received during the campaign from a variety of owner-occupiers, investors and developers,” Mr Wells said. “This strong sales result reflects the substantial appetite for inner city hotel investments we are currently witnessing. [urbanRelatedPost][/urbanRelatedPost]The Laird Hotel is a traditional two-storey corner pub with a ground floor bar, pool room, nightclub area and large outdoor courtyard. The first floor provides six hotel accommodation rooms and common lounge area and kitchen. In Kew East, Colliers International’s Hamish Burgess, Jeremy Gruzewski, Ted Dwyer sold six tenancies across three side-by-side addresses (605-613 High Street, 1-3 Stratalbyn Street and 31 Valerie Street) in the suburb’s best retail location amidst a hot contest among local and offshore investors. “In front of a 50-strong crowd, three bidders fought it out before the property was knocked down at $3.93 million,” Mr Burgess said. “Bidding started at $3 million, and all three bidders were local private investors. The substantial 688sqm landholding comprised a two-storey commercial building currently home to five retail shop fronts and a first floor office/residence. Its location high on a hill has also made it ideal for ancillary income from telecommunication towers, of which there are currently two on the first floor roof. In Hoppers Crossing, Colliers International’s Ashley McIntyre and Brent Glassford sold a 470sqm industrial strata property at 9/67 Elm Park Drive to a private investor through their self-managed superannuation fund for $555,000. “Investors are beating down our doors looking for property in the western suburbs,” Ms McIntyre said. “When the vendors of 9/67 Elm Park Drive approached us looking for a fresh approach to selling their property, we advised them to take it to auction. Auction was the best option for this property, as it shows urgency and creates competition. There were four bidders in total and a crowd of about 50 people in attendance on auction day.